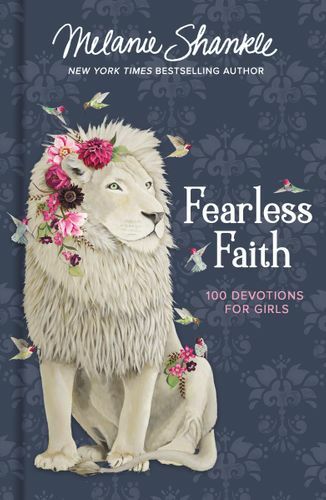 From popular blogger and bestselling author Melanie Shankle comes Fearless Faith: 100 Devotions for Girls, an interactive book that encourages girls 8 and up to answer questions, participate in fun activities, and be brave in their walk with God. Each day includes a brief Scripture verse, an encouraging message, and a corresponding activity or set of questions to frame the day’s takeaway in the real world. Readers will grow more confident in their faith, find ways to positively impact the world around them, and seek the beauty in everyday life. The 100-day devotional has a reader-friendly “Day 1,” “Day 2” format, allowing girls to start at any time of the year and to pick the book back up when they’ve had to step away. The questions and takeaways speak directly to where tween girls are in their day-to-day lives, with examples like: What are three things that make you happy? What do you worry about? What do you think God wants for your life? Throughout the devotional, there will also be fun activities to complete with friends and family. Featuring a beautiful cover, full-color interior, and a ribbon marker, Fearless Faith is perfect for back to school and holiday gift-giving.